Since graduating from college in 1980, I have been a Full-Time Disc jockey. It’s the only job I have ever had, and why not? What other job can you have where every time you go to work, everyone is in a great mood and ready to party!! I started working in nightclubs in 1980. My first club was “The Ark” in Boston. In 1981, I was hired by Shenanigans in Canton, which was owned by Barrett Family Restaurants. I am still employed by Barrett’s, where I am the Head Disc Jockey and Entertainment Director. I currently spin the music at the Charlie Horse in West Bridgewater. Among the other nightclubs I have worked at over the years were Checkers oldies club, Lauderdale’s, The Tent, and The Rack. 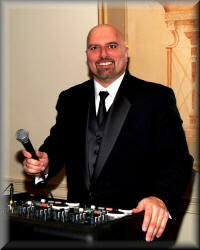 In 1980, I was hired for the first time as the Disc Jockey for a wedding. Since then, I have been honored to be hired as the entertainment for over 1,200 weddings. It has become a passion for me to be such an important part of the biggest day in people’s lives. I believe one of the reasons for my success is the personal service which I give to each couple. I am not a large company that employs many DJ’s. You will talk to me directly and meet with me prior to your event, unlike many companies in which you meet with a coordinator and may never see your DJ until the day of your event. When you hire me as your entertainment, I will be the DJ at your function! You can reach me with any questions or ideas at any time prior to your function. I hope the website answers some of your questions. Best of luck and I look forward to being a part of your special day! In order to keep my prices reasonable, I do not maintain an office. Over the years, I have found that most people are very busy during the planning stages of their event, and they find it more convenient to meet at their home or a convenient location.